Eric Prokopi loves fossils. Even as a child he was taken with hunting fossils. After graduating from college, he created a business buying and selling fossils. He became extremely skilled in collecting, preserving, and mounting them. His work was displayed in museums around the world, collected by movie stars and other wealthy fans, and auctioned off for thousands of dollars. Perhaps his finest work was the mounting of a skeleton of T. bataar, a Tyrannosaurus relative that stood 8 feet tall and 24 feet long. When the gavel fell at the end of its auction, over $1 million had been offered. Rather than enriching Eric Prokopi, though, the gavel marked the beginning of the end of his career. T. bataar’s skeleton had been smuggled illegally out of Mongolia, and the Mongolians wanted her back. 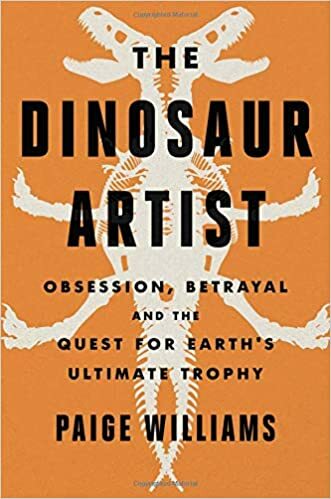 Paige Williams is an outstanding journalist, but her work writing The Dinosaur Artist reads more like a thriller novel. Her prose is outstanding, her research is amazing, and the story is compelling and incredible. Eric Prokopi and his entire family gave her full access to their lives: interviews, documents, emails, introductions to friends and colleagues. They did so with no idea what she would write. She could have written a book condemning Prokopi as a smuggler and a thief. Certainly the material was there for that. He was accused and convicted of those crimes and sentenced to jail. His family fell apart, his business went bankrupt, and many of his friends abandoned him. He was even made the villain of a children’s book in Mongolia which told the story of the stolen dinosaur and her wonderful return home. What Williams writes instead is a clear-eyed look at the entire fossil industry, telling the story of previous men whose rivalries caused the “bone wars” of the 1800s, of a paleontologist whose adventures may have inspired the character of Indiana Jones, of a woman who was so good that her pieces were mounted in the finest museums but whose upbringing was so common that she herself was not permitted in some of those same museums, and of a boy who grew up loving fossils–and who was willing to break laws and bypass customs as an adult to get them. She does not excuse or defend Eric Prokopi. What she does is put his crime into context, showing how he allowed hubris and greed and poor judgment to guide his actions, but also how he was swept up in international politics and bad timing. Prokopi broke the law. He was not the first (nor is he the last). Many others were (and are) doing the same things. Sometimes it is less about the crime committed than about the timing, the publicity, and the politics. In this case, it was about all of that. The Dinosaur Artist is a true story. It is well researched, beautifully written, and hard to put down. Anyone interested in a very different sort of true crime story, in paleontology, or in modern Asian politics will find it fascinating.